Well it sure looks like you are making great progress. The hardware on the flight deck is looking awesome. Thanks Mark. Been slow going for a while. This campaign has motivated me to finish it up. Also glad the Campaign has provided that motivation, I know what is like to get stuck on a big build, I have been there myself. Glad you have kept things going whilst time has kept me out of the workshop. Trying to get the deck vehicles finished... Also added tow-bars to some of the aircraft. I like number 2 also. All these builds are looking good, I’ll have an update on the independence CVL-22 soon. Have completed a lot but I am horrible about posting updates to logs. Better than anything I have been plating with. Guys, Not sure if you are interested or not, but I noticed there is no award ribbon for this build. I was playing around making some for other builds and thought I would stretch and do a couple for this build too. Up to you if you want to use them or come up with your own. Nice work on The Stern boat dock Thomas, the aircraft and the vehicles really add to the deck too. Thomas, the Reagan looks really good and I am amazed at the panel lines on the A/C. Thanks Bob. The Trumpeter aircraft come with nice engraved panel lines. All I had to do was a pin wash to bring them out. Bob: Following along with that height of hull issue I mentioned above, remembering that the Fujimi Lexington was released very early by the 1/700 scale waterline conglomerate of companies, I believe that where the red waterline plate is affixed to Lex is where the red portion of the under hull would be, as opposed to the boot top location on that Enterprise you have. Assuming that is so, then I would not try any radical hull surgery on the hull to make it lower. I would simply put the boot topping above the waterline plate, and if you intend to mount Lex in a sea base no one would know any difference, as the difference would not show. 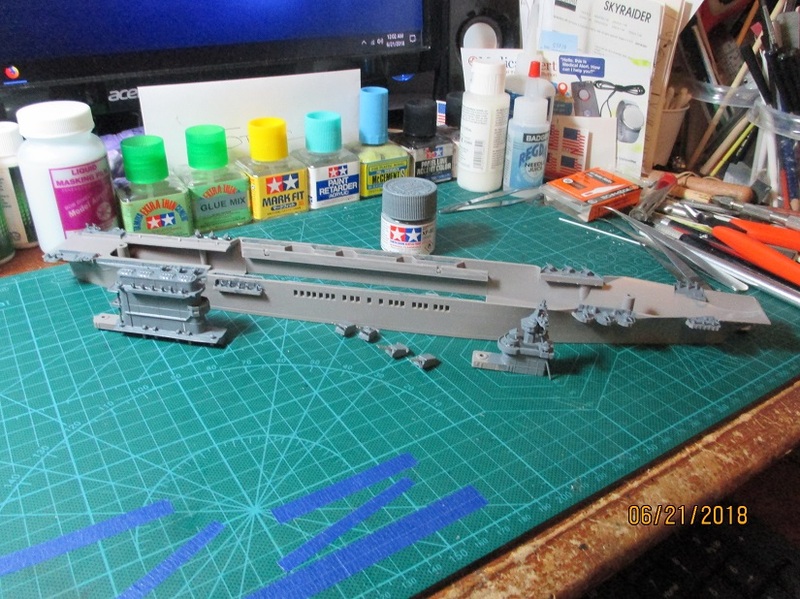 I built the Fujimi Lexington, it seems like a lifetime ago, but there are a couple of things I want to bring to your attention, based upon my memory of the kit. The hill seems to my eye to be to high from the waterline plate to the flight deck. You may want to check that out with scale drawings before you get too far along. Remember Lex and Sara started life as battle cruisers, and as such design allowances had to be made to convert them to carriers. The second thing is the stern round down on the flight deck. The round down itself is all steel and not covered with planking as it is (perhaps was) on the model. That would have to be sanded smooth. Fujimi also has the center line molded all the way to the extreme rear of the flight deck. That should also be removed along with the planking on the round down. During this time frame you are shooting for I have absolutely no idea if Lexington had any flight deck markings. I have never seen a photo that shows any, but that does not mean they were not there. Don't know what to say other than that. Were it me though, and seeing is how these marking areas are molded in, I would probably use them. Don't think anyone would be in a position to say you were wrong. Other than that though both the Fujimi and Ming kits are well suited for a Lexington in the late 41 to April 42 configuration. Never did understand though why the model company would not provide the option of 8" guns or quad 1.1 inch guns and let the modeler decide. Bob, Lexington looking pretty good. Is that 1/700 scale? Thomas, yes it is 1/700. I thought that I would start small. Nice progress on your Lady Lex. Thomas, she looks good and I love the flight deck full of a/c. A little progress on my Lexington. Looks very impressive, a nice line up on the deck. Si, that looks great! You have incredible patience working all that brass! Are you going to have to paint in sub-assemblies? Yes I am, the main hull, and the three sections of the flight deck will be painted separately, and then brought together. Bow on with aircraft spotted on deck. Work to be done: add ordnance jettison ramps, add stern boat dock, add tow tractors and fire trucks, re-do signal flag lines with thinner line (maybe add signal flags), add US Flag.